Converging studies have shown that M1 and M2 macrophages are functionally polarized in response to microorganisms and host mediators. Gene expression profiling of macrophages reveals that various Gram-negative and Gram-positive bacteria induce the transcriptional activity of a “common host response,” which includes genes belonging to the M1 program. However, excessive or prolonged M1 polarization can lead to tissue injury and contribute to pathogenesis. The so-called M2 macrophages play a critical role in the resolution of inflammation by producing anti-inflammatory mediators. These M2 cells cover a continuum of cells with different phenotypic and functional properties. In addition, some bacterial pathogens induce specific M2 programs in macrophages. In this review, we discuss the relevance of macrophage polarization in three domains of infectious diseases: resistance to infection, infectious pathogenesis, and chronic evolution of infectious diseases. Antigen-presenting cells such as monocytes/macrophages play major roles as sentinels for first line alerts or as mediators that shape the adaptive immune response (1). Once activated by microbial products, macrophages acquire microbicidal competence that usually leads to effective immunity (2). However, several bacterial pathogens have evolved strategies to interfere with macrophage activation and to modulate host responses (3). Macrophages are dynamic and heterogeneous cells; this is due to different mechanisms governing their differentiation, tissue distribution, and responsiveness to stimuli (4, 5). The heterogeneity of undifferentiated circulating monocytes may affect their polarization once they arrive in tissues (6, 7). In addition, the microenvironment, such as intestines, adipose tissue, or alveolar space, may also constrain the functional properties of macrophages (8, 9). Polarized macrophages have been broadly classified into two groups: M1 and M2 macrophages. During the 1970s, classically activated M1 macrophages were described as responsive to two signals, type 1 inflammatory cytokines and microbial products (2). More recently, M2 macrophages have been characterized by functional expression of alternative activation markers. 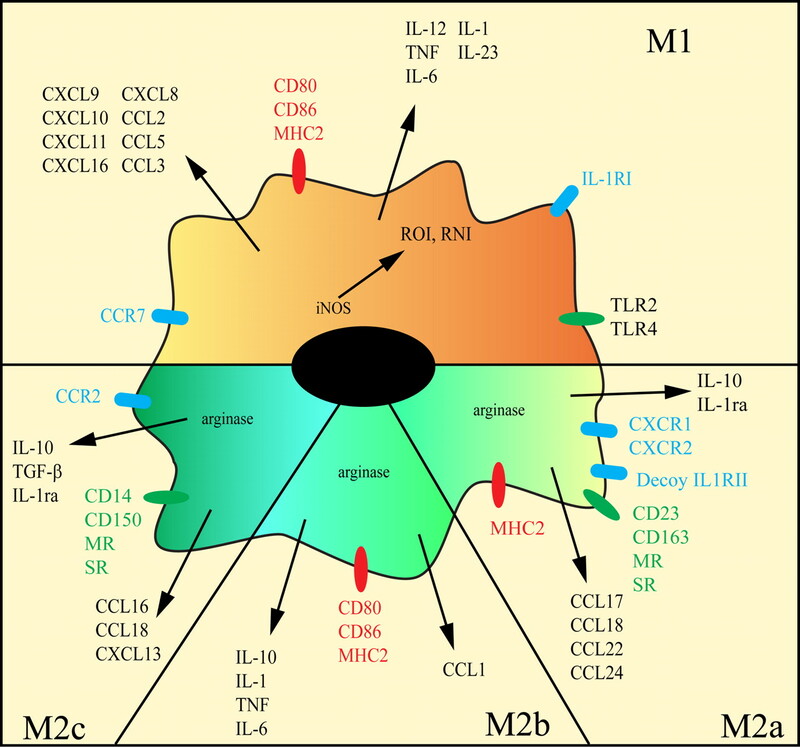 M2 macrophages include at least three subsets: M2a, induced by IL-4 or IL-13; M2b, induced by immune complexes and agonists of TLRs or IL-1 receptors; and M2c, induced by IL-10 and glucocorticoid hormones (10). M1 and M2 macrophages differ in terms of receptors, cytokine and chemokine expression, and effector functions (Fig. 1⇓). Whereas M1 macrophages are microbicidal and inflammatory (postinfectious pathogenesis), M2 macrophages are immunomodulators (M2a and M2c) and are poorly microbicidal. Thus, macrophage activation can be either pro-inflammatory or anti-inflammatory. However, these extreme and simplified polarization states (M1 vs M2) actually describe a complex process delineating a continuum of functional states. Recently, macrophage activation has been shown to be plastic, rapid, and fully reversible, suggesting that macrophage populations are dynamic and may first take part in inflammation and then participate in its resolution (11). Consequently, macrophages display progressive functional changes resulting from changes in the microenvironment (12). In this review, we will delineate the significance of macrophage polarization in the context of pathophysiology in acute and chronic infectious diseases. General concepts and properties of polarized macrophages. Classically activated macrophages (M1) are induced through LPS and/or microbial product stimulation. Their inflammatory repertoire is characterized by the secretion of proinflammatory mediators and the release of reactive oxygen and nitrogen intermediates (ROI and RNI, respectively). In contrast, alternative activation of macrophages (M2) covers a continuum of functional states classified as M2a, induced by IL-4/IL-13, M2b, induced by immune complexes and TLR agonists, and M2c, induced by IL-10 and glucocorticoid hormones. Several studies suggest that host cells exposed to different groups of pathogens respond with common transcriptional activation programs, referred to as the core response to infection. A comparison of data collected from 32 published transcriptional-profiling studies show that a cluster of 511 genes, the “common host response,” is coregulated in innate immune cells in response to 77 pathogens, including bacteria, viruses, and fungi (13). In human peripheral leukocytes stimulated with Gram-negative and Gram-positive bacteria, some genes encoding inflammatory and cell-to-cell signaling molecules are also commonly regulated (14). Finally, Nau and colleagues have shown that human monocyte-derived macrophages respond with a robust and shared pattern of gene expression to a broad range of bacteria (15). Although these studies reveal a core reprogramming of the host transcriptome during infection, none focuses on macrophage polarization as a result of host-pathogen interactions. In this review, we collate and compare microarray data from 12 studies released into public databases (14, 15, 16, 17, 18, 19, 20, 21, 22, 23, 24) and from unpublished results (Gene Expression Omnibus record number: GSE5765). These studies represent transcriptional responses of mononuclear phagocytes to diverse bacteria and bacterial components. The data sets were processed by considering modulated genes involved in M1/M2 polarization. Together, 87 unique genes were extracted from these data and classified into four families: cytokine/cytokine receptors, chemokine/chemokine receptors, effector molecules, and pattern recognition receptor/costimulation molecules. To avoid comparison biases resulting from independent experiments performed on different platforms, we used a clustering analysis to permit the grouping of genes with a common expression pattern across samples. The resulting matrix displays color-coded gene expression ratios, where green represents down-regulated gene transcription and red represents up-regulated gene transcription. The common response of macrophages to bacterial infections mainly involves the up-regulation of genes involved in M1 polarization (Fig. 2⇓). These include genes encoding cytokines such as TNF, IL-6, IL-12, IL-1β, cytokine receptors such as IL-7R and IL-15RA, chemokines such as CCL2, CCL5, and CXCL8, and the chemokine receptor CCR7. Other M1-associated up-regulated genes encode the enzymes indoleamine-pyrrole 2,3 dioxygenase and NO synthase 2 (NOS2),2 which are involved in macrophage microbicidal activity, and costimulatory molecules such as CD80 and CD86. IL-1ra appears to be the only gene associated with M2 polarization that is expressed after bacterial challenge. It is likely that this robust M1-shifted activation corresponds to the common alarm signal against bacteria induced in macrophages, as most of these genes are induced independently of the bacterial species. Common transcriptional signature of macrophages in response to bacterial infections. Transcriptional data from 12 studies on the response of human and mouse macrophages to several bacteria and bacterial components were analyzed by hierarchical clustering analysis and represented by a color gradient from green (down-regulation) to red (up-regulation). Only genes involved in M1/M2 polarization that were modulated in at least one condition were included. Gray box represents unavailable data. Abbreviations/designations not defined elsewhere: BCG. Bacillus Calmette-Guérin; BCGhsp65, BCG heat shock protein 65; B. melitensis, Brucella melitensis; B. pertussis, Bordetella pertussis; C. pneumoniae, Chlamydophila pneumoniae; EHEC, enterohemorrhagic E. coli; L. pneumophila, Legionella pneumophila; LPS E, E. coli LPS; LPS S, Salmonella LPS; LTA, lipoteichoic acid; MDP, muramyl dipeptide; M. leprae, Mycobacterium leprae; MPA, mycophenolic acid; S. aureus, Staphylococcus aureus; TBhsp70, tuberculosis heat shock protein 70. The M1 program of macrophages is usually associated with protection during acute infectious diseases. For instance, Listeria monocytogenes, which causes disease in immunocompromised patients and pregnant women, induces an M1 program, thus preventing bacterial phagosome escape and stimulating intracellular killing of bacteria in vitro and in vivo (25). Mice lacking IFN-γ and TNF, two canonical markers of M1 polarization, and their respective receptors die from L. monocytogenes infection (26). Similarly, Salmonella typhi, the agent of typhoid fever, and Salmonella typhimurium, a gastroenteritis agent, induce the M1 polarization of human and murine macrophages, and this induction is associated with the control of the infection. The protective role of M1 macrophages has been exemplified in mice deficient for components of the IL-12 pathway (27). The initial transcriptomic analysis of mouse macrophage responses to Mycobacterium tuberculosis reveals an overlap of genes modulated by mycobacteria and IFN-γ, which corresponds to an M1 program (28). In addition, during the early phase of M. tuberculosis infection, macrophages are polarized toward an M1 profile (29), which is in agreement with clinical data collected from patients with active tuberculosis. However, a small subset of tuberculosis patients is characterized by M2-type patterns, which can be reversed by antibiotic treatment (30). Other mycobacterial diseases such as Buruli disease (Mycobacterium ulcerans) and opportunistic infections (Mycobacterium avium) are also characterized and controlled by M1 polarization of macrophages (31, 32). Similarly, the acute phase of chlamydial infections is characterized by protective M1 polarization as emphasized in IFN-γ−/−IFN-γR−/− mice or in mice treated with anti-IFN-γ Abs (33). NO is another feature of M1 polarization known to be important in Salmonella infections (34); however, a role for NO has not been confirmed in murine models of chlamydial infections. As mentioned above, M1 polarization supports resistance to intracellular bacteria and controls the acute phase of infection. However, an excessive or prolonged M1 program is deleterious for the host, as demonstrated in acute infections with Escherichia coli or Streptococcus sp. E. coli causes many diseases, including gastroenteritis, urinary tract infections, neonatal meningitis, and sepsis. Sepsis couples systemic inflammatory response with immune dysregulation, leading to tissue damage and multiple organ failure (35). In vitro, E. coli induces a typical M1 profile through the recognition of LPS by TLR4 (36, 37). Signaling mechanisms include NF-κB activation, LPS-induced TNF-α factor up-regulation (38), and PI3K pathway stimulation (37). It has been demonstrated that M1 program induction and sepsis severity are related. In baboon experimental peritonitis caused by E. coli, the M1 phenotype is prominent in baboons that die from the infection; in contrast, surviving baboons display a mixed M1/M2 activation phenotype (39). In patients with severe sepsis, high circulating concentrations of M1-type cytokines are highly correlated with mortality (40). Macrophages from these patients produce high levels of type 1 cytokines and chemokines that activate the endothelium and contribute to cardiac failure, loss of general organ perfusion, and death (41). Streptococcus species can cause meningitis, pneumonia, endocarditis, erysipelas, and necrotizing fasciitis in humans and other animals. Host responses are generally characterized by an intense inflammatory reaction and an M1 polarization of macrophages involving the TLR2-dependent pathway (42). Human and murine macrophages differ in their responses to Streptococcus pyogenes. In humans, this pathogen induces a M1 profile characterized by enhanced mRNA expression of CCL2, CCL5, CXCL8, and CXCL10 (43). In mice S. pyogenes stimulates an unusual activation program that combines M1 and M2 profiles (44). In a murine model of pneumonia caused by S. pneumoniae, mortality correlates with lung inflammation and the presence of M1-polarized macrophages (45). It is well established that intracellular bacteria subvert microbicidal effectors to survive in the hostile environment produced by macrophages. A growing number of studies show that some pathogens have evolved different strategies to interfere with M1 polarization. Some Salmonella or Mycobacterium species neutralize M1-related effectors. S. typhimurium SPI-2 encodes mediators that inhibit phagosome relocalization of NADPH oxidase, thus inhibiting the oxidative microbicidal activity of macrophages (46). Similarly, Mycobacterium bovis bacillus Calmette-Guérin interferes with NOS2 recruitment to phagosomes, inhibiting NO release (47). Other bacterial strategies include inhibition of M1 cytokine expression/secretion. Salmonella dublin suppresses IL-18 and IL-12p70 production (48). Through the membrane protein Omp25, Brucella suis inhibits the production of TNF in human macrophages, leading to reduced production of IL-12 (49). Mycobacteria interfere with M1 polarization through the secretion of virulence factors. Early secreted antigenic target protein-6 (ESAT-6) from M. tuberculosis directly inhibits the activation of NF-κB and IFN-regulatory factors downstream of TLR2 via Akt-dependent mechanisms (50). Mycobacteria also interfere with M1 activation via indirect mechanisms. Macrophages are unable to kill highly pathogenic strains of M. tuberculosis despite IFN-γ stimulation; this is thought to rely on the transcriptional inhibition of IFN-γ-targeted genes through a bystander effect involving IL-6 (51). Although IL-6 is classically associated with M1 polarization, it can inhibit the production of a subset of IFN-γ-responsive genes, including CXCL10 (52). Coxiella burnetii is an obligate intracellular bacterium that causes Q fever, an acute disease with a risk of chronic evolution in immunocompromised patients, pregnant women, or patients with valve disease (53). It elicits an M1 program in monocytes (our unpublished data) and an atypical M2 profile in macrophages combining M1/M2 characteristics (24). C. burnetii-infected macrophages release the M2-associated molecules IL-10, TGFβ1, and CCL18 and express mannose receptor and the active form of arginase-1. They also secrete high levels of IL-6 and CXCL8, two molecules associated with M1 polarization (Fig. 3⇓). However, C. burnetii-infected macrophages do not express other M1 molecules such as TNF, IL-12, CD80, and CCR7, and they fail to produce NO (24). As in mycobacterial infections, it is likely that IL-6 interferes with the IFN-γ pathway and contributes to chronic evolution of Q fever. Other pathogens stimulate a clear-cut M2 program in macrophages. For instance, Yersinia enterocolitica infection of susceptible BALB/c mice results in arginase-1 activation and TGFβ1 and IL-4 production (54). The M2 reprogramming of macrophages depends on yersinial virulence factors; the infection of murine macrophages with bacteria defective for the Yop-encoded type III secretion system results in M1 polarization (55). LcrV, another Yersinia sp. virulence factor, stimulates M2 polarization, probably via the induction of IL-10 (56). Macrophage polarization and C. burnetii. C. burnetii stimulates an M1 profile in monocytes that control bacterial replication. C. burnetii induces an atypical M2 profile in macrophages. M2 macrophages are unable to control C. burnetii replication, as observed during acute Q fever. In the presence of M2 cytokines such as IL-10 or following the ingestion of apoptotic cells, C. burnetii-infected monocytes and macrophages are polarized toward M2 cells, thus allowing for intense bacterial replication. This may be observed during the chronic evolution of Q fever. Chronic evolution of infectious diseases is thought to be associated with macrophage reprogramming toward an M2 profile. Chronic brucellosis is associated with IL-10-mediated M2 polarization. Neutralization of the M2-promoting cytokines IL-10 and IL-4 in susceptible mice allows Brucella abortus killing by macrophages through IFN-γ production and the restoration of M1 profiles (57). The presence of M2 macrophages is also critical for the chronic fate of mycobacterial infections, and high levels of M2 macrophage-derived IL-10 are found in early ulcerative lesions of Buruli disease (31). Similarly, in lepromatous lesions, macrophages overexpress IL-10 (58) and members of the leukocyte Ig-like receptor (LIR) family, including LIR-7. LIR-7 has been shown to suppress innate host defense mechanisms by shifting monocyte polarization toward an M2 profile associated with IL-10 secretion (59). LILRA2, another member of LIR family, is expressed in lepromatous lesions and enables the expression of specific cytokine pattern associating inflammatory cytokines and IL-10 in monocytes (60). Dendritic cell-specific ICAM-grabbing nonintegrin-positive (DC-SIGN+) macrophages have been found in skin lepromatous lesions (61). Their differentiation requires TLR and IL-15, known to enhance the microbicidal competence of macrophages (62). Although lepromatous leprosy is considered a paradigm of Th2 response, the status of macrophages in patients is not consistent with a M2 profile. 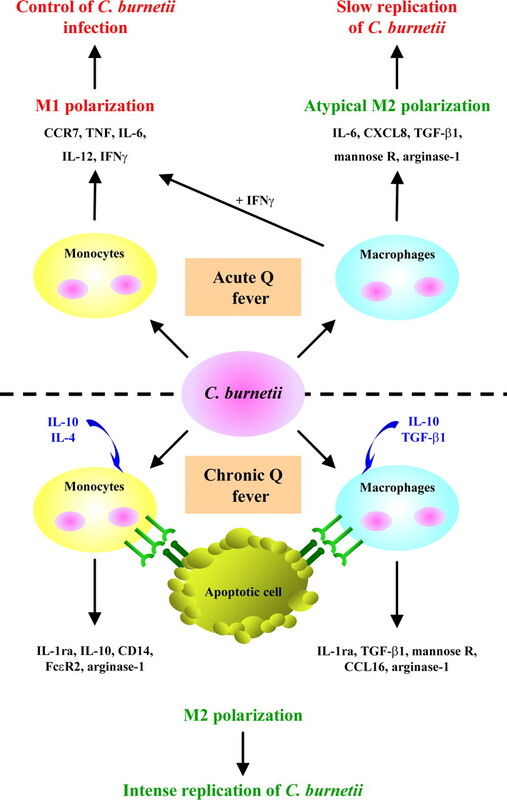 The pivotal role of IL-10 in chronic Q fever and the replication of C. burnetii within macrophages has been demonstrated in vitro and in vivo (Fig. 3⇑). IL-10 is overproduced by monocytes from patients with Q fever endocarditis, the major clinical expression of the chronic disease (63), and is sufficient to drive bacterial replication via altered phagosome biogenesis (64). In transgenic mice overexpressing IL-10 in macrophages, the tissue burden of C. burnetii increases while granuloma formation is impaired. These macrophages are characterized by the up-regulation of arginase-1, Yim 1/2, and mannose receptor and by the repression of NOS2 and inflammatory cytokines (65). The M2 profile of macrophages has also been observed in a model of persistent infection in mice deficient for Vanin-1, a membrane-anchored pantetheinase that controls tissue inflammation (66). In addition, the uptake of apoptotic cells by monocytes and macrophages is critical for chronic evolution of Q fever (67). Patients with cardiac valve lesions who have elevated levels of circulating apoptotic leukocytes have the highest risk of developing endocarditis after acute Q fever. In monocytes, the ingestion of apoptotic cells induces a program characterized by the up-regulation of IL-10, IL-19, IL-20, IL-24 (three members of IL-10 family), IL-1ra, CCL18, and CCL24; in macrophages, expression of CD14, TGFβ1, IL-1ra, IL-10, CCL16, and mannose receptor is markedly increased. This pattern is associated with C. burnetii replication and accounts for chronic evolution of Q fever. Interestingly, IFN-γ prevents C. burnetii replication induced by apoptotic cells and reprograms monocytes and macrophages toward an M1 profile (67). This study clearly demonstrates that M2 macrophages are associated with the chronic evolution of Q fever only when type 1 mediators are absent. Whipple’s disease is a rare systemic disease caused by Tropheryma whipplei; the chronic evolution of this disease is associated with tissue infiltrates of foamy macrophages with M2 profile characteristics (Fig. 4⇓). In vitro, monocytes and macrophages display different susceptibilities toward T. whipplei. Whereas the bacteria are killed by monocytes in which a mild M1 polarization is found, T. whipplei actively replicates in macrophages in which an M2 profile is observed (17). Transcriptional analysis has identified new candidates involved in monocyte and macrophage polarization. In T. whipplei-infected macrophages, genes encoding CCL15 and IL-16 are up-regulated. Interestingly, IL-16 promotes T. whipplei replication in monocytes and enhances bacterial growth in macrophages, suggesting that IL-16 might play a role in M2 polarization. The transcriptional profile of intestinal infiltrating cells, mainly comprised of macrophages, has been investigated in a biopsy from a patient with intestinal Whipple’s disease (68). CCL18, Scavenger receptor, CD14, IL-1ra, and IL-10 are markedly up-regulated in the infected intestinal tissue, consistent with an M2 profile of infiltrated macrophages. Notably, M2 polarization in intestinal tissue is almost identical to that observed in macrophages treated in vitro with IL-4 and IL-13. Whipple’s disease is associated with an M2 macrophage profile. In vitro, T. whipplei stimulates opposite polarization of monocytes and macrophages. T. whipplei is killed by monocytes that are M1 polarized. In contrast, T. whipplei replicates in macrophages that are M2 polarized. In patients with Whipple’s disease, T. whipplei is mainly detected in intestinal infiltrated macrophages. These macrophages are M2 polarized. This polarization may be due to the shift of leukocyte secretion from IL-2 and IFN-γ toward IL-4 in response to Ag stimulation and to increased circulating levels of IL-16 and apoptotic cells. Analysis of gene expression has revealed a continuum of activation signatures in macrophages. From public databases, it is possible to summarize a “common host response” of macrophages to bacterial infections with an M1 signature. Usually, the M1 signature is associated with the control of acute infections, but it may also be responsible for infectious pathogenesis if uncontrolled. Some bacterial pathogens have evolved sophisticated strategies to prevent M1 polarization, neutralize microbicidal effectors of macrophage, or promote M2 polarization. The persistence of bacterial pathogens in tissues and the chronic evolution of infectious diseases are linked to macrophage reprogramming toward heterogeneous M2 signatures. The development of gene expression analysis in clinical situations will be essential to understand the precise role of macrophage polarization in resistance/susceptibility to infection, clinical expression, and prognosis of infectious diseases. ↵2 Abbreviations used in this paper: NOS2, NO synthase 2; LIR, leukocyte Ig-like receptor. Hoebe, K., E. Janssen, B. Beutler. 2004. The interface between innate and adaptive immunity. Nat. Immunol. 5: 971-974. Mackaness, G. B.. 1964. The immunological basis of acquired cellular resistance. J. Exp. Med. 120: 105-120. Russell, D. G.. 2007. Who puts the tubercle in tuberculosis?. Nat. Rev. Microbiol. 5: 39-47. Gordon, S.. 2003. Alternative activation of macrophages. Nat. Rev. Immunol. 3: 23-35. Mosser, D. M.. 2003. The many faces of macrophage activation. J. Leukocyte Biol. 73: 209-212. Gordon, S., P. R. Taylor. 2005. Monocyte and macrophage heterogeneity. Nat. Rev. Immunol. 5: 953-964. Strauss-Ayali, D., S. M. Conrad, D. M. Mosser. 2007. Monocyte subpopulations and their differentiation patterns during infection. J. Leukocyte Biol. 82: 244-252. Lambrecht, B. N.. 2006. Alveolar macrophage in the driver’s seat. Immunity 24: 366-368. Lumeng, C. N., J. L. Bodzin, A. R. Saltiel. 2007. Obesity induces a phenotypic switch in adipose tissue macrophage polarization. J. Clin. Invest. 117: 175-184. Mantovani, A., A. Sica, S. Sozzani, P. Allavena, A. Vecchi, M. Locati. 2004. The chemokine system in diverse forms of macrophage activation and polarization. Trends Immunol. 25: 677-686. Porcheray, F., S. Viaud, A. C. Rimaniol, C. Leone, B. Samah, N. Dereuddre-Bosquet, D. Dormont, G. Gras. 2005. Macrophage activation switching: an asset for the resolution of inflammation. Clin. Exp. Immunol. 142: 481-489. Stout, R. D., J. Suttles. 2004. Functional plasticity of macrophages: reversible adaptation to changing microenvironments. J. Leukocyte Biol. 76: 509-513. Jenner, R. G., R. A. Young. 2005. Insights into host responses against pathogens from transcriptional profiling. Nat. Rev. Microbiol. 3: 281-294. Boldrick, J. C., A. A. Alizadeh, M. Diehn, S. Dudoit, C. L. Liu, C. E. Belcher, D. Botstein, L. M. Staudt, P. O. Brown, D. A. Relman. 2002. Stereotyped and specific gene expression programs in human innate immune responses to bacteria. Proc. Natl. Acad. Sci. USA 99: 972-977. Nau, G. J., J. F. Richmond, A. Schlesinger, E. G. Jennings, E. S. Lander, R. A. Young. 2002. Human macrophage activation programs induced by bacterial pathogens. Proc. Natl. Acad. Sci. USA 99: 1503-1508. Detweiler, C. S., D. B. Cunanan, S. Falkow. 2001. Host microarray analysis reveals a role for the Salmonella response regulator phoP in human macrophage cell death. Proc. Natl. Acad. Sci. USA 98: 5850-5855. Desnues, B., D. Raoult, J. L. Mege. 2005. 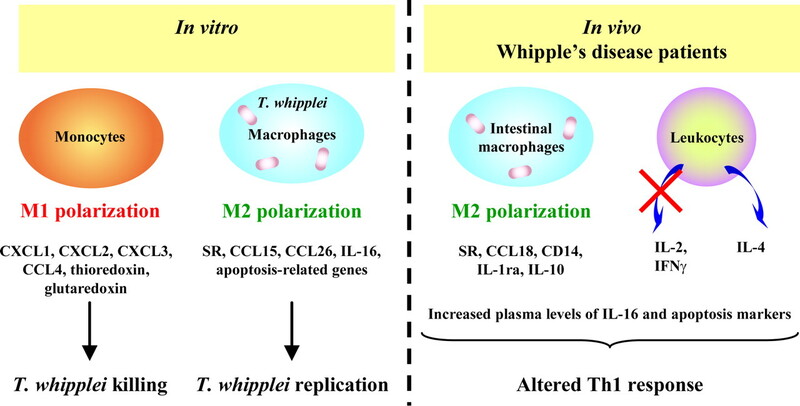 IL-16 is critical for Tropheryma whipplei replication in Whipple’s disease. J. Immunol. 175: 4575-4582. He, Y., S. Reichow, S. Ramamoorthy, X. Ding, R. Lathigra, J. C. Craig, B. W. Sobral, G. G. Schurig, N. Sriranganathan, S. M. Boyle. 2006. Brucella melitensis triggers time-dependent modulation of apoptosis and down-regulation of mitochondrion-associated gene expression in mouse macrophages. Infect. Immun. 74: 5035-5046. Khajoee, V., M. Saito, H. Takada, A. Nomura, K. Kusuhara, S. I. Yoshida, Y. Yoshikai, T. Hara. 2006. Novel roles of osteopontin and CXC chemokine ligand 7 in the defence against mycobacterial infection. Clin. Exp. Immunol. 143: 260-268. Losick, V. P., R. R. Isberg. 2006. NF-κB translocation prevents host cell death after low-dose challenge by Legionella pneumophila. J. Exp. Med. 203: 2177-2189.
van Erp, K., K. Dach, I. Koch, J. Heesemann, R. Hoffmann. 2006. Role of strain differences on host resistance and the transcriptional response of macrophages to infection with Yersinia enterocolitica. Physiol. Genomics 25: 75-84. Auffray, C., D. Fogg, M. Garfa, G. Elain, O. Join-Lambert, S. Kayal, S. Sarnacki, A. Cumano, G. Lauvau, F. Geissmann. 2007. Monitoring of blood vessels and tissues by a population of monocytes with patrolling behavior. Science 317: 666-670. Rodriguez, N., J. Mages, H. Dietrich, N. Wantia, H. Wagner, R. Lang, T. Miethke. 2007. MyD88-dependent changes in the pulmonary transcriptome after infection with Chlamydia pneumoniae. Physiol. Genomics 30: 134-145. Benoit, M., B. Barbarat, A. Bernard, D. Olive, J. L. Mege. 2008. Coxiella burnetii, the agent of Q fever, stimulates an atypical M2 activation program in human macrophages. Eur. J. Immunol. 38: 1065-1070. Shaughnessy, L. M., J. A. Swanson. 2007. The role of the activated macrophage in clearing Listeria monocytogenes infection. Front Biosci. 12: 2683-2692. Pfeffer, K., T. Matsuyama, T. M. Kundig, A. Wakeham, K. Kishihara, A. Shahinian, K. Wiegmann, P. S. Ohashi, M. Kronke, T. W. Mak. 1993. Mice deficient for the 55 kd tumor necrosis factor receptor are resistant to endotoxic shock, yet succumb to L. monocytogenes infection. Cell 73: 457-467. Jouanguy, E., R. Doffinger, S. Dupuis, A. Pallier, F. Altare, J. L. Casanova. 1999. IL-12 and IFN-γ in host defense against mycobacteria and salmonella in mice and men. Curr. Opin. Immunol. 11: 346-351. Ehrt, S., D. Schnappinger, S. Bekiranov, J. Drenkow, S. Shi, T. R. Gingeras, T. Gaasterland, G. Schoolnik, C. Nathan. 2001. Reprogramming of the macrophage transcriptome in response to interferon-γ and Mycobacterium tuberculosis: signaling roles of nitric oxide synthase-2 and phagocyte oxidase. J. Exp. Med. 194: 1123-1140. Chacon-Salinas, R., J. Serafin-Lopez, R. Ramos-Payan, P. Mendez-Aragon, R. Hernandez-Pando, D. Van Soolingen, L. Flores-Romo, S. Estrada-Parra, I. Estrada-Garcia. 2005. Differential pattern of cytokine expression by macrophages infected in vitro with different Mycobacterium tuberculosis genotypes. Clin. Exp. Immunol. 140: 443-449. Raju, B., Y. Hoshino, I. Belitskaya-Levy, R. Dawson, S. Ress, J. A. Gold, R. Condos, R. Pine, S. Brown, A. Nolan, et al 2008. Gene expression profiles of bronchoalveolar cells in pulmonary TB. Tuberculosis (Edinb.) 88: 39-51. Kiszewski, A. E., E. Becerril, L. D. Aguilar, I. T. Kader, W. Myers, F. Portaels, R. Hernandez Pando. 2006. The local immune response in ulcerative lesions of Buruli disease. Clin. Exp. Immunol. 143: 445-451. Murphy, J. T., S. Sommer, E. A. Kabara, N. Verman, M. A. Kuelbs, P. Saama, R. Halgren, P. M. Coussens. 2006. Gene expression profiling of monocyte-derived macrophages following infection with Mycobacterium avium subspecies avium and Mycobacterium avium subspecies paratuberculosis. Physiol. Genomics 28: 67-75. Rottenberg, M. E., A. Gigliotti-Rothfuchs, H. Wigzell. 2002. The role of IFN-γ in the outcome of chlamydial infection. Curr. Opin. Immunol. 14: 444-451. Igietseme, J. U., L. L. Perry, G. A. Ananaba, I. M. Uriri, O. O. Ojior, S. N. Kumar, H. D. Caldwell. 1998. Chlamydial infection in inducible nitric oxide synthase knockout mice. Infect. Immun. 66: 1282-1286. O'Reilly, M., D. E. Newcomb, D. Remick. 1999. Endotoxin, sepsis, and the primrose path. Shock 12: 411-420. Liang, M. D., A. Bagchi, H. S. Warren, M. M. Tehan, J. A. Trigilio, L. K. Beasley-Topliffe, B. L. Tesini, J. C. Lazzaroni, M. J. Fenton, J. Hellman. 2005. Bacterial peptidoglycan-associated lipoprotein: a naturally occurring Toll-like receptor 2 agonist that is shed into serum and has synergy with lipopolysaccharide. J. Infect. Dis. 191: 939-948. Tang, X., D. Metzger, S. Leeman, S. Amar. 2006. LPS-induced TNF-α factor (LITAF)-deficient mice express reduced LPS-induced cytokine: evidence for LITAF-dependent LPS signaling pathways. Proc. Natl. Acad. Sci. USA 103: 13777-13782. Mehta, A., R. Brewington, M. Chatterji, M. Zoubine, G. T. Kinasewitz, G. T. Peer, A. C. Chang, F. B. Taylor, Jr, A. Shnyra. 2004. Infection-induced modulation of M1 and M2 phenotypes in circulating monocytes: role in immune monitoring and early prognosis of sepsis. Shock 22: 423-430. Lopez-Bojorquez, L. N., A. Z. Dehesa, G. Reyes-Teran. 2004. Molecular mechanisms involved in the pathogenesis of septic shock. Arch. Med. Res. 35: 465-479. Kadioglu, A., P. W. Andrew. 2004. The innate immune response to pneumococcal lung infection: the untold story. Trends Immunol. 25: 143-149. Veckman, V., M. Miettinen, S. Matikainen, R. Lande, E. Giacomini, E. M. Coccia, I. Julkunen. 2003. Lactobacilli and streptococci induce inflammatory chemokine production in human macrophages that stimulates Th1 cell chemotaxis. J. Leukocyte Biol. 74: 395-402. Goldmann, O., M. von Kockritz-Blickwede, C. Holtje, G. S. Chhatwal, R. Geffers, E. Medina. 2007. Transcriptome analysis of murine macrophages in response to infection with Streptococcus pyogenes reveals an unusual activation program. Infect. Immun. 75: 4148-4157. Smith, M. W., J. E. Schmidt, J. E. Rehg, C. J. Orihuela, J. A. McCullers. 2007. Induction of pro- and anti-inflammatory molecules in a mouse model of pneumococcal pneumonia after influenza. Comp. Med. 57: 82-89. Vazquez-Torres, A., Y. Xu, J. Jones-Carson, D. W. Holden, S. M. Lucia, M. C. Dinauer, P. Mastroeni, F. C. Fang. 2000. Salmonella pathogenicity island 2-dependent evasion of the phagocyte NADPH oxidase. Science 287: 1655-1658. Miller, B. H., R. A. Fratti, J. F. Poschet, G. S. Timmins, S. S. Master, M. Burgos, M. A. Marletta, V. Deretic. 2004. Mycobacteria inhibit nitric oxide synthase recruitment to phagosomes during macrophage infection. Infect. Immun. 72: 2872-2878. Bost, K. L., J. D. Clements. 1997. Intracellular Salmonella dublin induces substantial secretion of the 40-kilodalton subunit of interleukin-12 (IL-12) but minimal secretion of IL-12 as a 70-kilodalton protein in murine macrophages. Infect. Immun. 65: 3186-3192. Dornand, J., A. Gross, V. Lafont, J. Liautard, J. Oliaro, J. P. Liautard. 2002. The innate immune response against Brucella in humans. Vet. Microbiol. 90: 383-394. Pathak, S. K., S. Basu, K. K. Basu, A. Banerjee, S. Pathak, A. Bhattacharyya, T. Kaisho, M. Kundu, J. Basu. 2007. Direct extracellular interaction between the early secreted antigen ESAT-6 of Mycobacterium tuberculosis and TLR2 inhibits TLR signaling in macrophages. Nat. Immunol. 8: 610-618. Ting, L. M., A. C. Kim, A. Cattamanchi, J. D. Ernst. 1999. Mycobacterium tuberculosis inhibits IFN-γ transcriptional responses without inhibiting activation of STAT1. J. Immunol. 163: 3898-3906. Nagabhushanam, V., A. Solache, L. M. Ting, C. J. Escaron, J. Y. Zhang, J. D. Ernst. 2003. Innate inhibition of adaptive immunity: Mycobacterium tuberculosis-induced IL-6 inhibits macrophage responses to IFN-γ. J. Immunol. 171: 4750-4757. Raoult, D., T. Marrie, J. L. Mege. 2005. Natural history and pathophysiology of Q fever. Lancet Infect. Dis. 5: 219-226. Tumitan, A. R., L. G. Monnazzi, F. R. Ghiraldi, E. M. Cilli, B. M. Machado de Medeiros. 2007. Pattern of macrophage activation in Yersinia-resistant and Yersinia-susceptible strains of mice. Microbiol. Immunol. 51: 1021-1028. Hoffmann, R., K. van Erp, K. Trulzsch, J. Heesemann. 2004. Transcriptional responses of murine macrophages to infection with Yersinia enterocolitica. Cell Microbiol. 6: 377-390. Brubaker, R. R.. 2003. Interleukin-10 and inhibition of innate immunity to Yersiniae: roles of Yops and LcrV (V antigen). Infect. Immun. 71: 3673-3681. Fernandes, D. M., X. Jiang, J. H. Jung, C. L. Baldwin. 1996. Comparison of T cell cytokines in resistant and susceptible mice infected with virulent Brucella abortus strain 2308. FEMS Immunol. Med. Microbiol. 16: 193-203. Sieling, P. A., R. L. Modlin. 1994. Cytokine patterns at the site of mycobacterial infection. Immunobiology 191: 378-387. Bleharski, J. R., H. Li, C. Meinken, T. G. Graeber, M. T. Ochoa, M. Yamamura, A. Burdick, E. N. Sarno, M. Wagner, M. Rollinghoff, et al 2003. Use of genetic profiling in leprosy to discriminate clinical forms of the disease. Science 301: 1527-1530. Lee, D. J., P. A. Sieling, M. T. Ochoa, S. R. Krutzik, B. Guo, M. Hernandez, T. H. Rea, G. Cheng, M. Colonna, R. L. Modlin. 2007. LILRA2 activation inhibits dendritic cell differentiation and antigen presentation to T cells. J. Immunol. 179: 8128-8136. Krutzik, S. R., B. Tan, H. Li, M. T. Ochoa, P. T. Liu, S. E. Sharfstein, T. G. Graeber, P. A. Sieling, Y. J. Liu, T. H. Rea, et al 2005. TLR activation triggers the rapid differentiation of monocytes into macrophages and dendritic cells. Nat. Med. 11: 653-660. Waldmann, T. A., Y. Tagaya. 1999. The multifaceted regulation of interleukin-15 expression and the role of this cytokine in NK cell differentiation and host response to intracellular pathogens. Annu. Rev. Immunol. 17: 19-49. Capo, C., Y. Zaffran, F. Zugun, P. Houpikian, D. Raoult, J. L. Mege. 1996. Production of interleukin-10 and transforming growth factor β by peripheral blood mononuclear cells in Q fever endocarditis. Infect. Immun. 64: 4143-4147. Ghigo, E., A. Honstettre, C. Capo, J. P. Gorvel, D. Raoult, J. L. Mege. 2004. Link between impaired maturation of phagosomes and defective Coxiella burnetii killing in patients with chronic Q fever. J. Infect. Dis. 190: 1767-1772. Meghari, S., C. Berruyer, H. Lepidi, F. Galland, P. Naquet, J. L. Mege. 2007. Vanin-1 controls granuloma formation and macrophage polarization in Coxiella burnetii infection. Eur. J. Immunol. 37: 24-32. Desnues, B., H. Lepidi, D. Raoult, J. L. Mege. 2005. Whipple disease: intestinal infiltrating cells exhibit a transcriptional pattern of M2/alternatively activated macrophages. J. Infect. Dis. 192: 1642-1646.